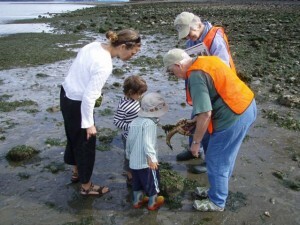 Become a Kitsap Beach Naturalist! Below is a plug for the upcoming Kitsap Beach Naturalist training. This program is a lot of fun, and you walk away having learned from some great speakers and carrying very helpful materials for identifying and understanding the creatures on our region’s beaches. You also get a great hat! Once you’ve completed the class, you can join as a Beach Naturalist on events coordinated during the summer daytime or winter nighttime low tides. Speaking of low tides… Today marks the first full day of spring AND the first daytime minus tides of 2011! 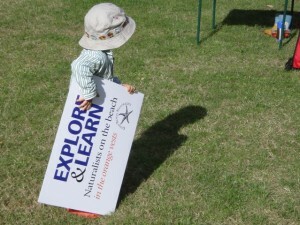 Join the Kitsap Beach Naturalist Class of 2011. Kitsap County has extraordinary beaches and a lot of people interested in enjoying and learning more about them. You can help while enriching your own experience. In the classroom and on field trips, Kitsap Beach Naturalist volunteers learn about seaweed, fish, invertebrates, clams, crabs, anemones, and friends). Marine riparian habitat and conservation, beach etiquette and beach walk coordination are also covered. We ask that you attend 4 of the 5 classes and 3 of the 4 field trips to graduate (and receive your nifty KBN hat!) and give back 20 hours of related volunteer service to the community over the following year. The Kitsap Beach Naturalists Program is coordinated by WSU Kitsap County Extension and Washington Sea Grant. Time: 9:30a.m.-12:30a.m. OR 6p.m. – 9p.m. Jeff Adams is a Washington Sea Grant Marine Water Quality Specialist, affiliated with the University of Washington’s College of the Environment, and based in Bremerton. You can follow his Sea Life blog, email to jaws@uw.edu or call at 360-337-4619. Been reading this website for a few weeks now. It was very good and specific knowledge. BTW, I love your website template as well. I enjoyed reading it and hopefully you will post more soon. Do you have a twitter page?